Wow! This chase may have replaced the Bowdle, SD day of May 22, 2010 as my favorite of all time. An incredible and fairly stress-free chase day with a number of firsts for me including the most tornadoes I’ve seen in a day and the first time I’ve seen three on the ground at once! All without ever being danger from the tornadoes or of even getting cored by big hail! Not to mention perhaps the worst chaser convergence I’ve seen, though that didn’t seem to cause much of a problem. We started the morning in Dumas, TX after the long drive the previous night. The target couldn’t have been more obvious: find the triple point on the Kansas/Oklahoma border and be there, and SPC had outlined a tight 10% tornado threat that told every chaser around exactly where to go. 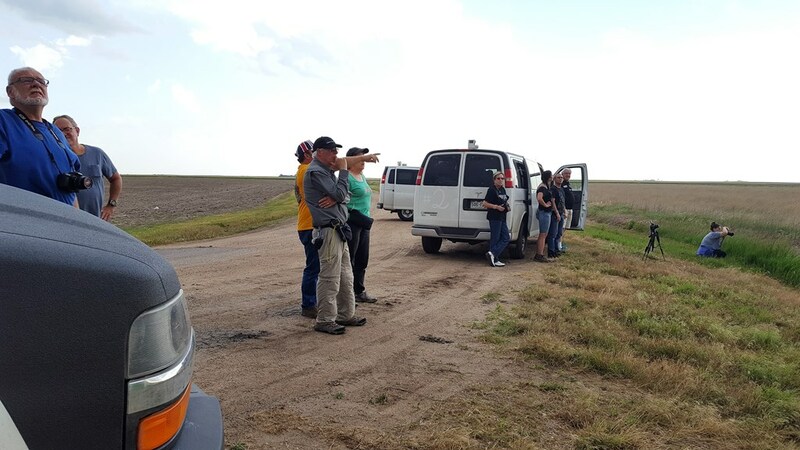 Our initial target was Woodward, OK. We headed up through Guymon then east and arrived at about 2 PM, noting immediately the swarms of chasers everywhere. As we’d approached town from the west, the triple point was clearly evident and towers were already developing along the boundary so we grabbed lunch and headed back northwest to get ready for the action, passing through Ft. Supply and up through Laverne, OK on Rt. 283. At the junction of 283 and 64, there was an empty dirt lot at the side of the road, but not empty today! There were at least 30 chase vehicles of every shape and size, and it was like a pre-NFL game tailgate! We continued through Rosston and headed north towards Englewood, KS and now things were firing: an initial storm around the warm front up near Scott City developed and immediately started producing tornadoes, while a tower just to our west got going and soon had tops passing through 45,000 feet on the way to 50,000. We paused to watch for a while as the storm developed a broad base and strong upright updraft, and had that look to it. Continuing to meander north into Kansas, the storm really got going and with a generally northern track at about 10-20 mph was very easy to stay alongside. This was an interesting trait of all the storms today: None of them, no matter how severe they got, were right-movers. Had they been, the chaser convergence could have been a much bigger problem, but on our storm, Rt. 283 became storm-chaser highway. As we passed through Englewood, the storm was now developing a big hook on radar and a developing wall cloud that was spinning crazily. Soon we were through Minneola, KS and the storm was ready to do its thing. We stopped along Rt. 283 about halfway between Minneola and Dodge City and setup our tripods as the wall cloud showed rapid rotation and rising motion, with that barrel rolling horizontal motion that those who chase know well! And moments later at 6:00 PM exactly, tornado! An elephant-trunk tornado that soon turned into a robust stovepipe right off the south edge of the mesocyclone. 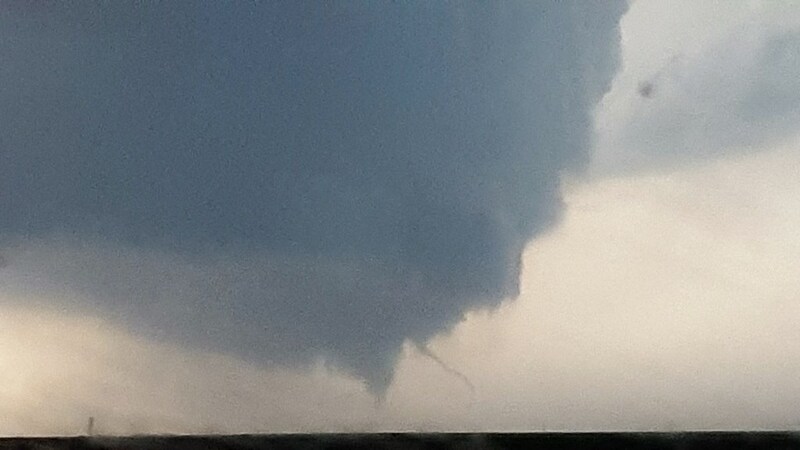 But wait, there were 3 areas of rotation, and almost immediately there were dirt swirls under the second one. Two tornadoes at once! That one quickly dissipated though and the stovepipe took center stage and persisted in various forms for probably close to an hour, occasionally lifting but soon coming back even bigger as a cone, stovepipe, elephant trunk, rope, you name it! The storm also had very large hail: at one point we stopped and there were a few hailstones of baseball size that we took pictures of. 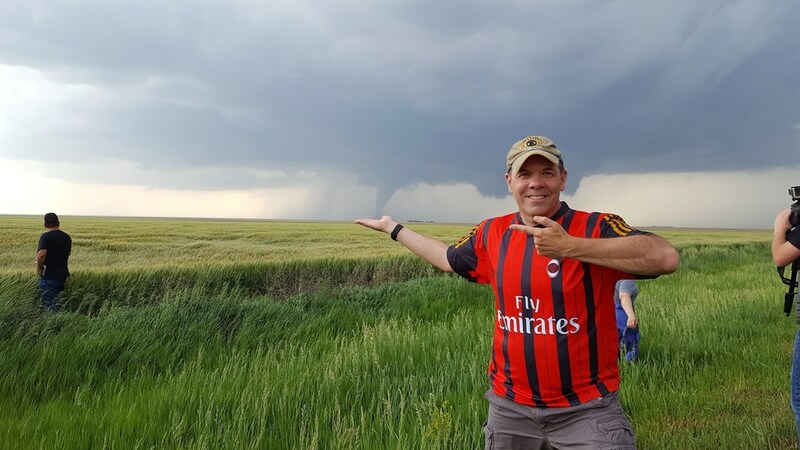 For the next 75 minutes, we observed tornado after tornado as the storm moved slowly north, and we were able to all take shots with the tornado behind us, spinning the tornado, etc. etc. The initial tornado turned into a big cone about 20 minutes in as we hopscotched north, stopped, watched and then jumped north again, etc. 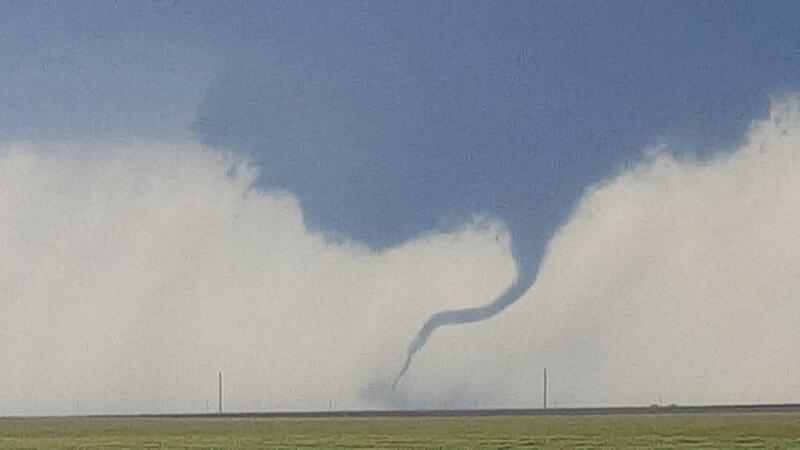 As we neared Dodge City with the cone still on the backside of the meso, another elephant trunk tornado formed towards the north side, and then morphed into a long ropey tornado. And then, another! Three at once! I initially thought the third, which was another ropey tornado, was a multi-vortex tornado with the second one, but as I zoomed my camera way in it was clear that the 3rd was on the back side of the rotation, moving right to left, while the 2nd was on the front moving left to right! They almost appear to be dancing in my video. Now the storm neared Dodge City and things started to get scary as the town declared a tornado emergency and the whole mesocyclone got lower and lower to the ground and the storm looked prepared to generate a big wedge tornado right over town. As it approached from the southwest, still spewing touchdown after touchdown, I observed a few power flashes on the outskirts, but luckily no large flying debris. The rotation of the mesocyclone was intense: a merry-go-round all the way around the broad area of rotation. The storm then produced its largest tornado, a big cone just on the outskirts of town which I believe did most of the damage we’d see later. Luckily, the tornado missed the center of town, passing just to the west. Soon we had to get north and were faced with what looked like a huge chaser traffic jam in the city, but we found a road that was relatively open and cleared the city to the east, watching to our north as the storm continued to drop tornadoes of every shape and size. We found ourselves on the north side of town by ourselves. Where did everyone go?? We weren’t complaining though as the storm continued to drop tornadoes, retract, and drop another, retract, etc. Finally, the show was winding down and now we were worried about getting cored by the next storm in line to our south. We got very strong wind and a little hail but nothing major. Looking at radar, there were still tornado warned storms all around us, but none of them were easily approachable from where we are, so we decided we’d had our fill and called it a day, especially since there was a gap in the cores that would let us get west towards our stop for the night at Garden City, KS. As we headed west, we saw some of the damage that had been done: Rt. 400 was closed due to tornado damage and a flipped semi so we had to detour down to Rt. 56 and up Rt. 23 towards Cimarron. As we did, we saw numerous power lines down and farm irrigation equipment flipped, as well as trees shredded by large hail. When we got to Cimarron, the power was out. As we drove away though, the storm continued to give us a show. First, tremendous crepuscular rays like spotlights on a rainbow as we got west of the storm, and then a pretty mammatus show stretching for miles hanging out of the back of the merged anvils from the line of storms. What a chase day! We saw a solid 12-15 tornadoes and what must have easily been 50-60 touchdowns as the various rotations skipped up and down. The storm motion was interesting: I can only conclude that the storm was so wrapped into the boundary that it couldn’t turn right even though it was spinning ridiculously hard. What a storm!!! Miles for the day: 412. Unlike the rest of the trip, forecasting this day was a piece of cake! All points led to the triple point north of Woodward, OK. We (and every other chaser in the world) bee-lined it for Woodward for lunch then headed north. The first storm of the day pops near Englewood, KS. Now near Minneola, we stop to watch the rapidly developing storm. The storm quickly started rotating and soon there was a rapidly rotating wall cloud, about halfway between Minneola and Dodge City. First funnel of the day forms! Several of them simultaneously. That was a trait of this storm, it constantly had several areas of rotation around the mesocyclone. First tornado of the day, debris fan on the ground with funnel extending from cloud base. The tornado gets more robust. Fully extending to the ground. Just like that, the first tornado ropes out, but don't worry, there was plenty more where that came from! We hustled along Rt. 283 as the storm dropped additional tornadoes to our west. Ryan Shepard shows what makes a quality storm chase driver. Eyes on the road! The second tornado, big stovepipe all the way to the ground! A broader view, the big tornado grinding away with another area of rotation just to its north. Drill press mode! Watch as I spin this tornado on my palm! Wide shot of the storm with the SLT guests in the foreground. Broad view of the updraft. As the tornado widens even more, we hop back in the vans to keep up. Despite the enormous chaser-gaggle, everyone was well behaved and there were no issues. Getting closer to Dodge City, another needle tornado towards the front of the mesocylcone while the big stovepipe was still chugging along. Getting better defined with a little kink up near cloud base. Yup, the original tornado is still there! It's a two-fer! There are at least two distinct tornadoes here. I initially thought it was a single multi vortex tornado, but video shows that the larger one is hanging off the east side of the mesocyclone, while the second is hanging off the west and moving right to left. 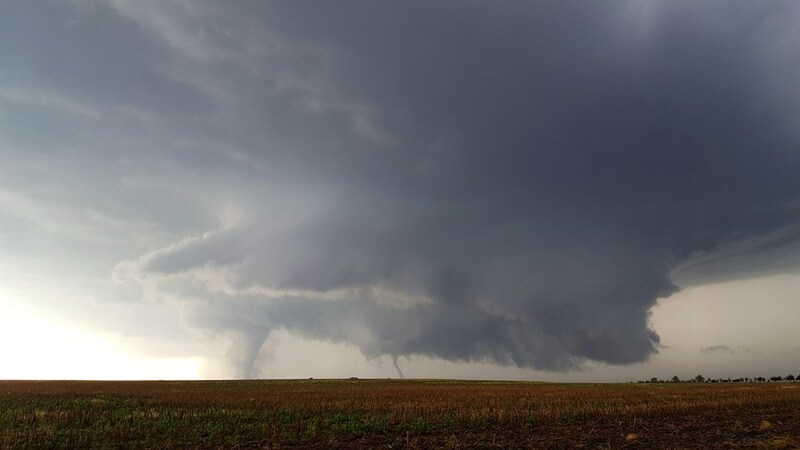 At least three tornadoes in progress at once! I was paying so much attention to the craziness at the front of the meso that I almost forgot the big dog still bringing up the rear! Two or three distinct funnels at once. 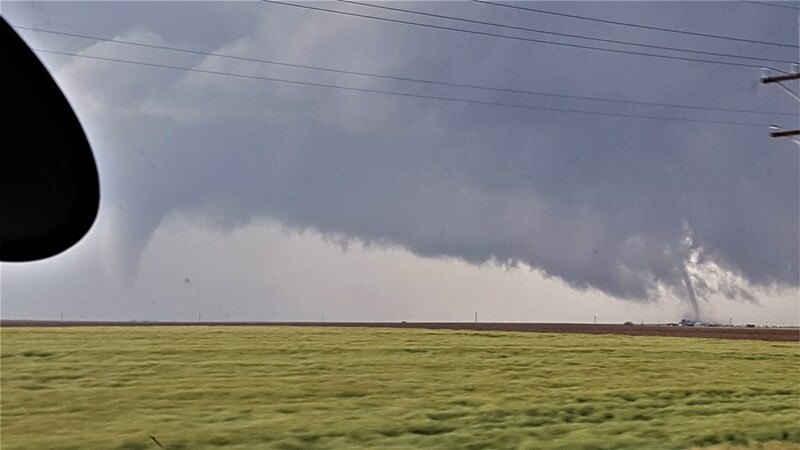 There were at least three tornadoes on the ground several times from this storm. Trying to drop a second big tornado as the meso jumps forward. Fantastic storm structure with two tornadoes at once. All kinds of chaos in this shot. The first large tornado finally starts to fizzle out. Ropeout! But wait, it's not done yet! A few minutes later, the meso cycles and another big tornado forms! Meanwhile we pass through an area where tennis ball sized hail had recently fallen. Cycling again, and getting dangerously close to Dodge City. Awesome updraft! Now just outside of Dodge, a large multi-vortex tornado spins up. 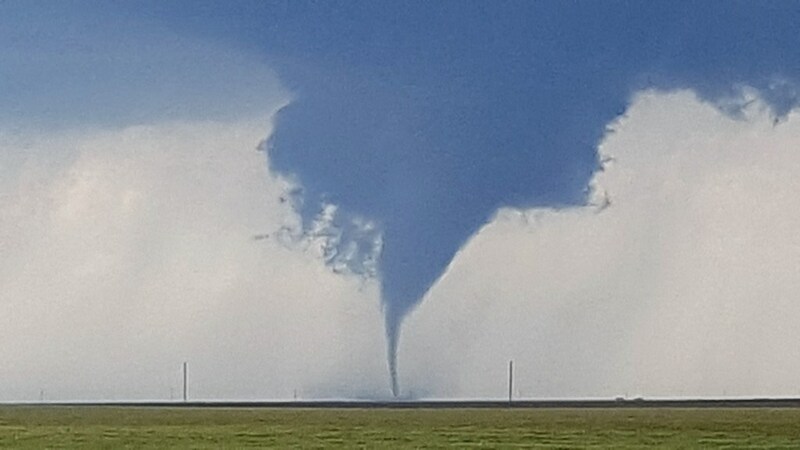 The tornado morph into a big cone just outside of town. Fortunately the storm never right-turned or Dodge City would have been in big trouble. This was likely the most violent tornado associated with the storm. The tornado at its widest. Dr. Howie Bluestein and his team gathering data. Back to classic Wizard of Oz format. Tornado ropes out as it passes west of town. We found a road to circumnavigate the city and continue the chase. 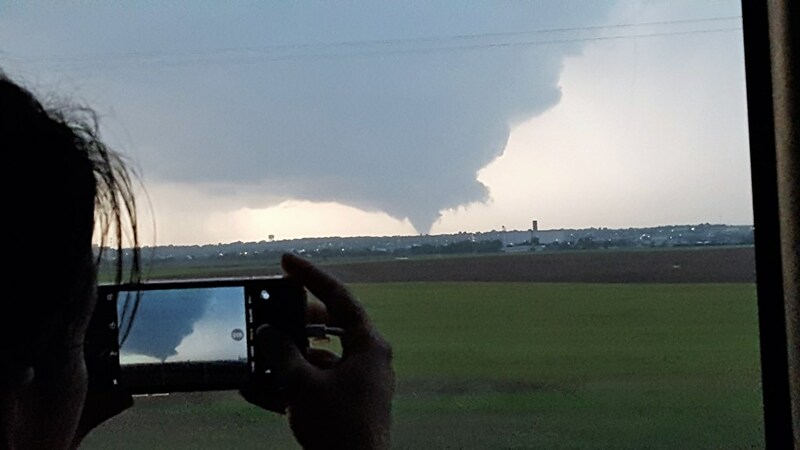 A picture of Connie taking a picture of a tornado. Now north of the City with a large tornado and satellite. Last tornado of the day. 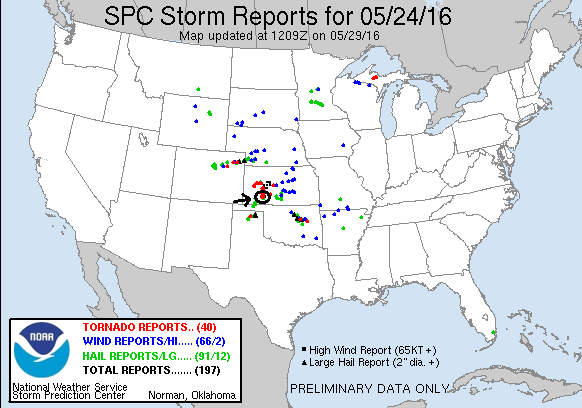 We counted a total of 14 tornadoes associated with this storm! The show was not quite over yet! West of the action are now on the way to our hotel in Garden City, a fantastic mammatus show to our east.